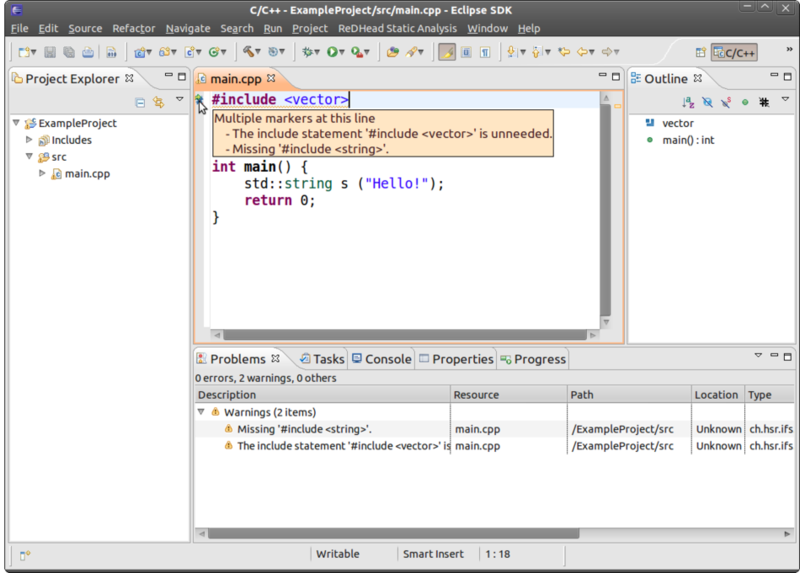 The Includator plug-in analyzes the dependencies of C++ source ﬁle structures generated by #include directives, suggests how the #include structure of a C++ project can be optimized and performs this optimization on behalf of the developer. The aim of these optimizations is to improve code readability and quality, to reduce the duration of builds and the development time of C++ software. Scans a single source ﬁle or a whole project for superﬂuous #include directives and proposes them to be removed. This also covers the removal of #include directives providing declarations that are (transitively) reachable through others. Ignores transitively included declarations and proposes to #include used declarations directly, if they are not already included. This provides an “include-what-you-use” code structure. 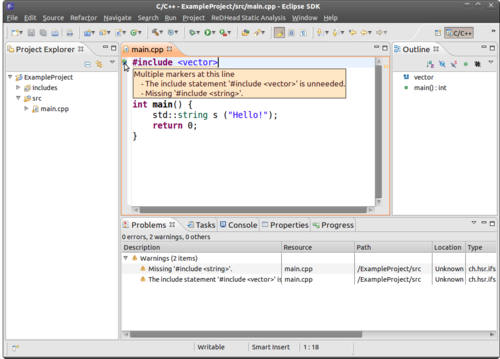 Similar to Eclipse Java Development Tool's Organize imports feature for Java. Adds missing #include directives and removes superﬂuous ones. Locates #include directives for deﬁnitions that can be omitted, when replacing them with corresponding forward declarations instead. This one is useful for minimizing #includes required in header ﬁles. Marks C++ source code as either used, implicitly used or unused by transitively following C++ elements’ deﬁnitions and usages. This helps to trim declarations and deﬁnitions not used from your source code. In contrast to dynamic code coverage, such as provided by our CUTE plug-in it allows to determine required and useless C++ declarations and deﬁnitions instead of executed oder not-executed statements. Locates single or even entangled header ﬁles that are never included in the project’s source ﬁles. Includator is still in beta testing. Register at includator.com if you are interested in becoming a beta tester, if you just want to try it or if you want to be notiﬁed about Includator releases.